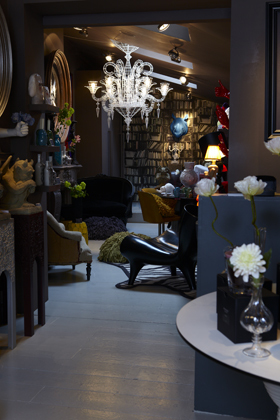 Will be posting more images in due course but wanted to share with you a few photographs we had taken of our store by the fabulous photographer Graham Atkins Hughes. The black chairs are new in (I’ve ordered two for the garden – sorry honey)! and as you will see its been designed very much like a home. Have layered the floor with rugs and rasta’s and the walls with mirrors and art. I have to sayÂ everything you see inÂ this image I actually have at home apart from the blue rhino on the back wall and he is a one off so I couldn’t very well pinch. So yes its true I don’t buy anything I wouldn’t want in my own pad. 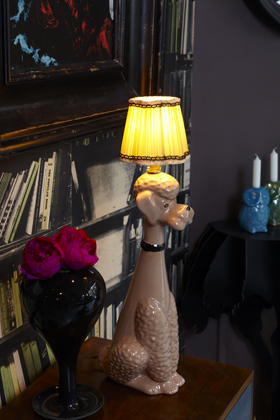 Our poodle light the first in our own range of lighting with more to come very shortly. Happy weekend everyone. Ours is a simple one a potter to the farmers market, spot of gardening, cooking with jazz oh and training lessons for Maud.